Understanding the cosmos, becoming a multi-planetary species, and increasing sustainable living here on Earth. These are all huge challenges with potential global impacts that have inspired generations of entrepreneurs, scientists, researchers, and builders to join the space community. Today, I joined many in the space community, as well as President Obama, in Pittsburgh at a conference to discuss the future of innovation in the US, around the world, and in outer space. Here on Earth, the space community and the infrastructure they’ve developed have allowed for humans to communicate with each other globally with telecommunication satellites, have a shared global coordinate system with GPS, and enabled global transparency in weather prediction and Earth-observation using imaging satellites. While invisible to most people, this space infrastructure is critical to the functioning of our day-to-day activities, and mostly have been built by governments around the world. Since 1957 when the first satellite launched to space, a lot here on Earth has changed: the human population has doubled, our forests have shrunk, our cities have grown, and our agriculture has become more productive, to name a handful of examples. While we have had many advances, there is an overarching sense that this change is so abundant, so massive that it feels beyond our ability to comprehend how we might monitor this change and, when needed, alter our own behavior to have a more desirable future. New sensors, and the data they collect will change this. With the advent of the microprocessor, the growth of the computer industry and information age, today we find ourselves in the midst of a sensor revolution powered by these foundational technologies. This is being driven by the consumer electronics industry in an effort to put ever more capable phones in our pocket. The sensors in these phones and gadgets have been ruggedized, miniaturized, and mass produced and are enabling connected homes, self-driving cars, and high-flying drones. It is this explosion of data-collecting sensors that will very soon enable us to understand the global change around us. Often times, great innovation occurs when innovators follow a convergence of trends and borrow solutions from one problem and apply it to another. This is where Planet fits in. At Planet, we set out to bring this terrestrial sensor revolution into space. If we can leverage the sensors powering the consumer electronics industry, then we can miniaturize the satellite and mass produce them, creating a disaggregated sensor network that can collect a new data set. This data, collected from space, not only allows us to see change on our planet, but to take that information and make better decisions. After starting just five years ago, Planet operates the world’s largest constellation of imaging satellites, collecting data of everywhere on the surface of the Earth, every week. In the next six months, our constellation of satellites will double in size and we’ll soon image the globe daily. Today, this data is finding myriad uses. The Washington Post used this information to visualize the growth of refugee camps. A non-profit monitoring the Amazon used this information to alert local authorities of illegal gold mining. And in just the last 10 days, this information was used by first responders aiding communities impacted by Hurricane Matthew. This information is making a difference, but it might not be here if it weren’t for the collaborative spirit of government. The growth of the space community, investment in space infrastructure, new sensors, and the collection of novel data is a sign of recent progress. In the last five years, the space community has experienced a shift in behavior. Bringing the sensor revolution into space means that the satellite can be smaller. If the satellite is smaller, then it costs less to get one satellite into space. These smaller satellites can be built quicker and more affordably, allowing for missions to be more responsive and to take increased risk, if appropriate. Collectively, this has resulted in a considerable decrease in the barrier to entry for new uses of space by new actors. It seems that with each passing month, there is a new space-bound company or initiative announced. This is extraordinary. It is like a new breed of aerospace entrepreneurs are forming with innovation coming from unlikely places to create new low-Earth orbit missions. We are finding ourselves at a rebirth of space activities – otherwise known as the Space Renaissance. Governments have been the driving force behind space activities since that first satellite went up, and today many governments are embracing this Space Renaissance. In the United States, we have the policies in place and the leadership committed to shift how things have been done before to encourage new approaches in space. This means the government is embracing being one of many commercial customers, rather than the only actor, and the government will create a regulatory environment that facilitates the Space Renaissance with not just oversight, but also with insight & foresight. There are many entrepreneurs and engineers captivated by the unknown with the drive to dedicate themselves to work on hard societal and technical challenges. They are around you today – they are are in their garage, as a side project at their work, or in the R&D lab at a university. Below is a picture of our team five years ago in my garage. But today, just five years later, there are perhaps hundreds or maybe even thousands of these teams around the world, employing new approaches to old problems and enabling new missions that were not possible before. This is the Space Renaissance and the beginning of the 21st century aerospace ecosystem. 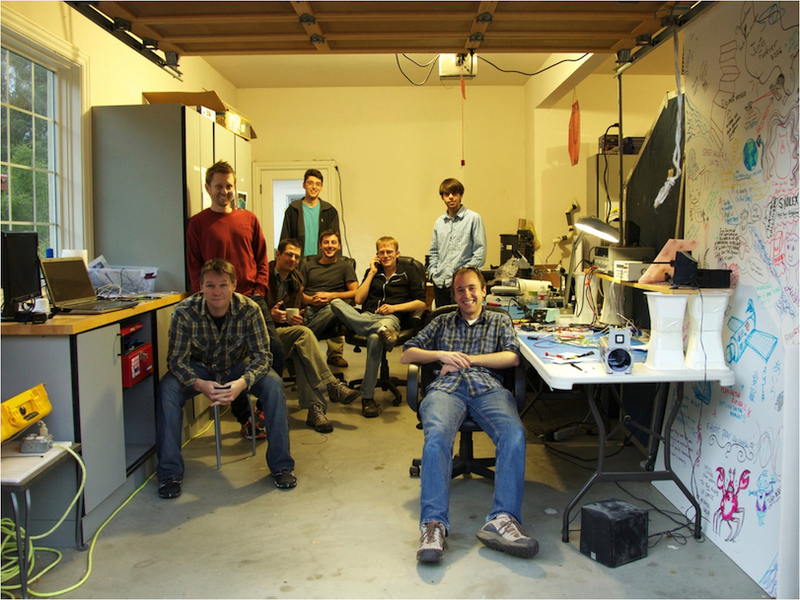 Planet’s founding team building satellites in a Cupertino garage in November 2011.